Are you an avid DIY-er who loves keeping up with the latest décor trends? Me too! With the first day of fall fast approaching comes a slew of new décor trends including chalk painted furniture. I never really paid much attention to chalky, matte furniture until I realized it’s SO easy to do – absolutely NO priming, stripping, or sanding required! Just pick a color you love and get started! 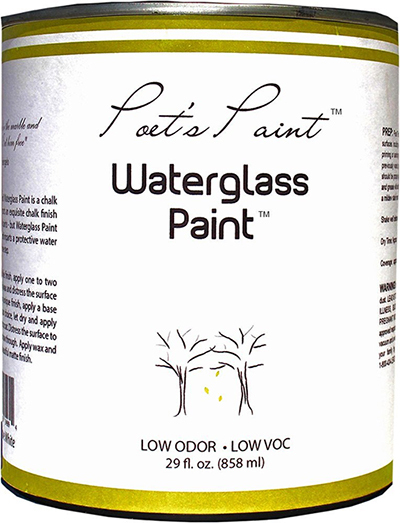 Today I’ll be highlighting one of my favorite paints – Poet’s Paint Waterglass Paint. If you are looking to re-paint a piece of furniture using chalk paint, I would definitely recommend this paint. Not only is it much more durable then other chalk paint, but it also provides a hard finish. Don’t get me wrong, you still get the same matte, chalky finish that distresses well but it’s much more durable with the liquid glass element. I LOVE furniture that looks like it has graciously aged well and chalk paint really provides a wonderful vintage look and feel. 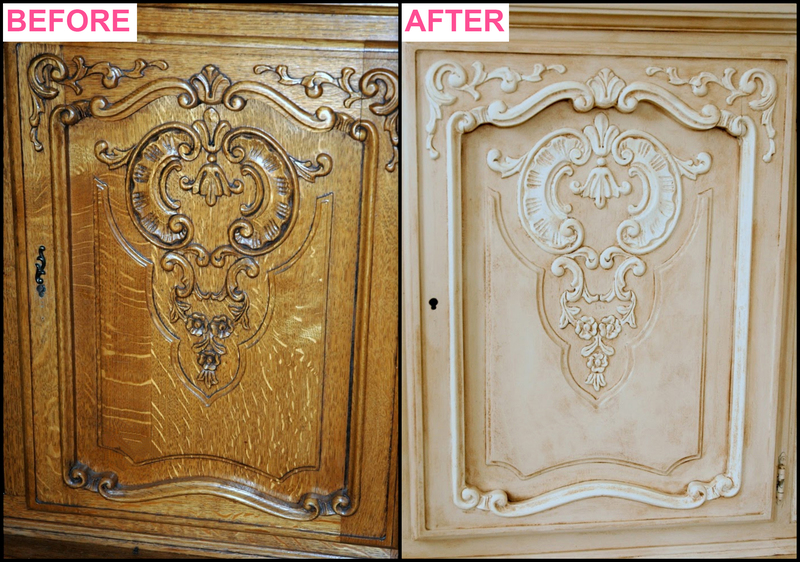 The nice finish really looks like the piece has been loved and cared for years! 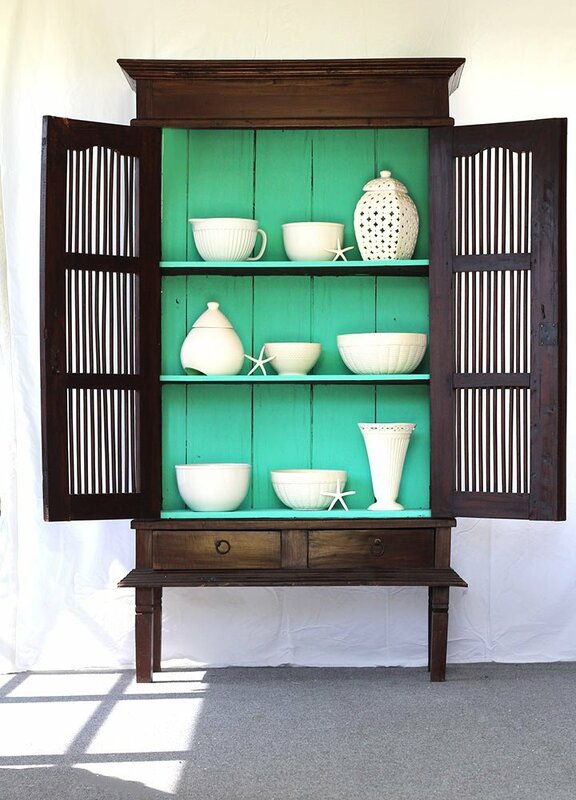 Just take a look at this lovely antique laquer cabinet re-done in chalk paint by Amanda from the blog One Girl in Pink. The gold and white combination is drop-dead gorgeous! 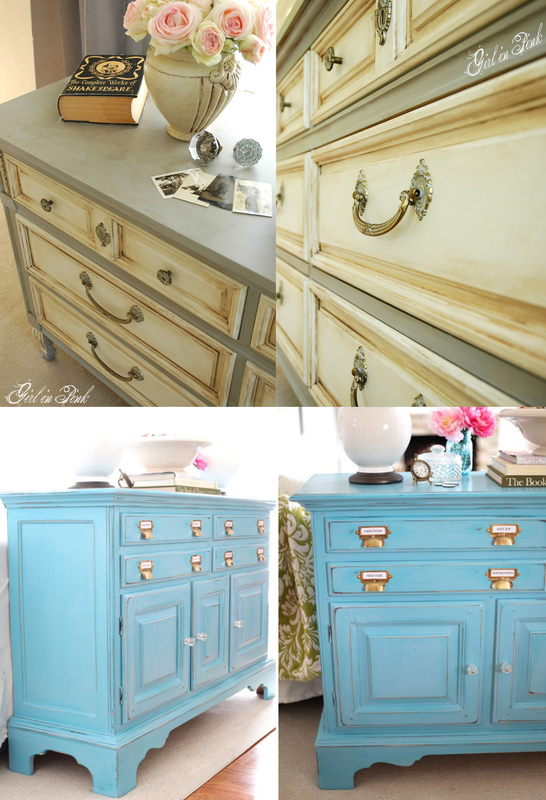 Here is the before and after – you would never guess that chalk paint was used! The matte effect is so pretty! There are so ways to get certain effects with chalk paint like sanding for a antiqued look or using a brush technique to get a washed out look. I came across the transformations below and was amazed at how the chalk paint perfectly outlined all the little groves, moldings, and intricate details on the furniture. If you have furniture that has precise little details, chalk paint will really outline every little grove and make it stand out like no other paint will. Check out the stunning blue buffet from In My Own Style – the bright hue adds such a cool wave of color. The key to getting a beautiful matte like finish is to apply 1-2 coats, let it dry, and then apply a wax and distress the surface with sandpaper. Another cool trick is to use a different colored base coat, this way when you sand the surface, the base coat will show through! 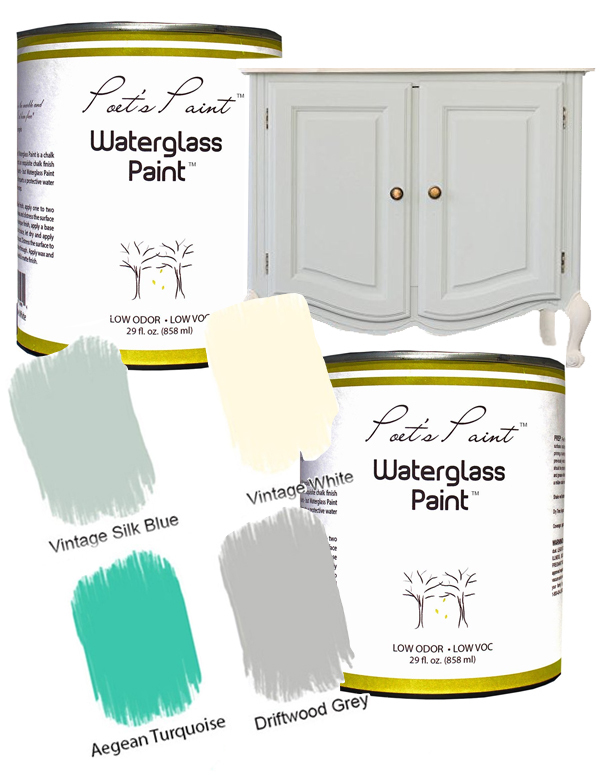 The Waterglass Paint from Poets Paint comes in vibrant shades like turquoise and more muted tones like vintage white, depending on the look you’re going for. If you can’t find the color you like, keep checking, as they will be adding new colors every 8 weeks! You can buy the paint on Amazon here. The color I think really stands out is the Aegan Turquoise that was used to bring out some life in the cabinet below. What’s your fave? This entry was posted in DIY and tagged better decorating bible blog, chalk paint on amazon, chalk painted furniture, decorating, distress furniture, let base coat show through, poets paint, refurbishing old furniture, repainting antique furniture, washed out look, water glass paint. Bookmark the permalink. I totally agree! It’s sometimes surprising how much potential a old, neglected piece of furniture can have. You never know till you try! I love the last media cabinet/console. The green color really brings it to life. I may use this idea in my dining room. 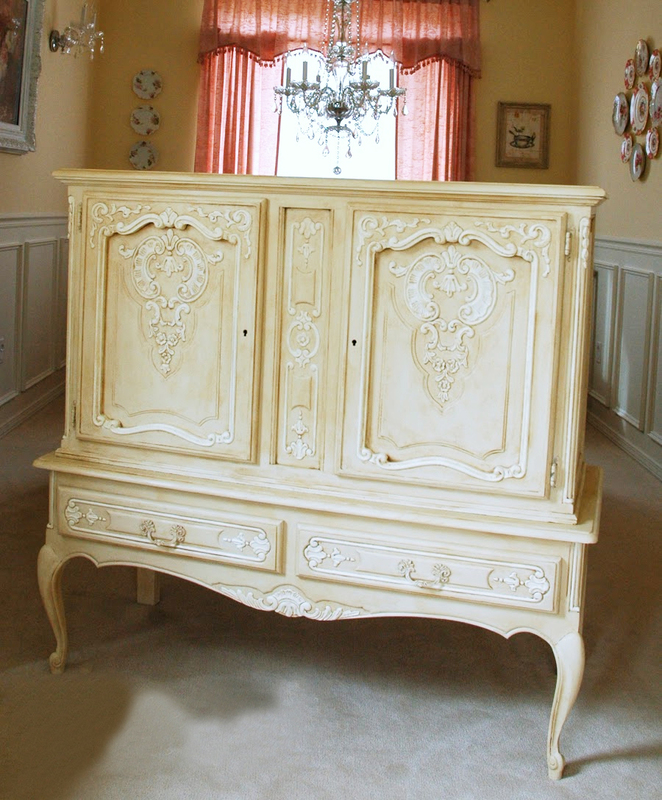 Does anyone know if you can buy the white chalk paint and add color to make your own shade? LOVE LOVE LOVE the turquoise color – by far my favourite color to decorate with! i’ve used chalk paint before with positive results. I did sand down the surface though to remove the old paint. is this actually necessary or can i just go ahead and paint over the old paint?! When it comes to chalk paint, there’s rarely any need to sand or prime before painting. However, if you have a shiny, rusty, or already painted surface, you should definitely give it a good sanding. I usually prefer shiny surfaces but i still really like the look of chalk paint. i’ll try adding a clear gloss to see if i can spice it up a bit! I can’t believe that this paint is so popular considering one of the most important characteristics of Chalk Paint is that it is safe to use indoors on furniture! Does anyone read the label? Would you like to paint your child’s furniture with this??? Would you want to use this daily as a vocation? Hi what inspiration for a beginner like me! Can you recommend a sander for small furniture, chairs, bookshelves, etc? I would really appreciate your expertise! Loving your blog! I have a dining room set that I have been racking my brain trying to figure out what color I wanted to paint it….As soon as I saw the “toile” turquoise and gold combination, it was a no brainer for me! I am so excited to get started and can’t wait to see the end result! I am positive it will be beautiful! Thank You for posting and I will be trying your paints! Sincerely, Jackie M.